This stunning residence is located in the heart of vibrant Shellharbour Village. Architecturally designed with a spacious floor plan, outdoor living areas, ocean views and quality finishes throughout. Starfish Beach House is your idyllic home away from home. Enjoy a luxury escape with your partner, family or friends with beaches, the boat harbour, ocean pools, restaurants, cafes and boutique shops virtually at your front door! A beautiful two story home, Starfish Beach House is completely self-contained offering upstairs and downstairs living areas, as well as alfresco dining and private courtyard downstairs. The two upstairs balconies offer sparkling views of the Tasman Sea. Starfish Beach House is air conditioned for year round comfort, has 3 generous size bedrooms, a gourmet kitchen, 2 bathrooms, a gaming nook and WIFI, double garage and fully equipped laundry. If you enjoy cooking, you will love the 900mm oven and gas hotplates, stone bench tops, stainless steel appliances, and quality cooking utensils, cutlery and crockery. The downstairs living area has a gorgeous leather lounge, large flat screen TV, Foxtel, DVD and music dock. Choose from indoor or outdoor dining with an outdoor lounge suite, BBQ and grassed area to relax in. Upstairs living features a corner leather lounge with recliners, large screen TV and DVD player. This area leads out to the large balcony and sun lounges, a great place to read a book and enjoy a wine. All three bedrooms come complete with luxury linen, 1000 count cotton bed sheets, waffle blankets, and wool doonas for the winter nights. 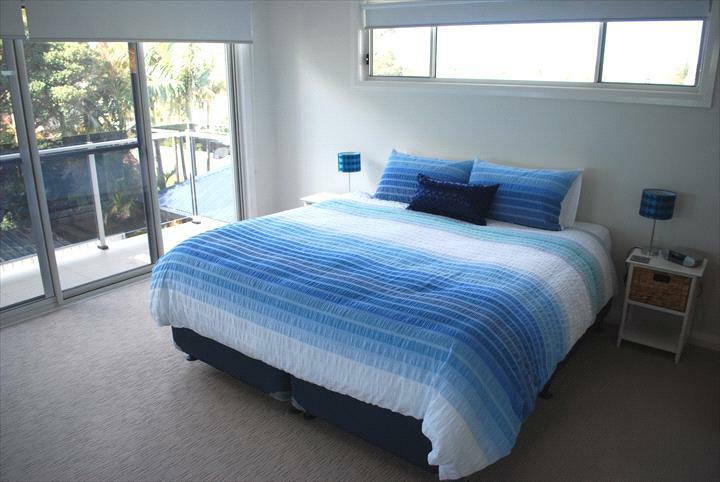 Starfish's spacious Master bedroom has an ensemble king size bed, ensuite, balcony and beautiful ocean views. The second bedroom has a queen size bed, WIR and lots of lovely natural light from the double windows. Bedroom three has 2 single ensemble beds, which can be made into a king size bed if you prefer. The Gaming Nook is ideal for the kids and kids at heart, complete with an Xbox 360 and a range of great games! Both bathrooms have beautiful rainfall showers and the main bathroom has a deep bath perfect for relaxing. Plush Egyptian cotton towels, hand towels and bath mats are provided. There are lots of extras to enjoy during your stay, you will find books, magazines, cookbooks, adults and kids board games, DVD and music collections, as well as buckets for the beach and beach towels. For stays longer than 1 week, a cleaning service is available to take care of the housework! Self contained luxury beach house with king bed in the master bedroom with ensuite, the 2nd room has a queen bed and the 3rd room has 2 single beds (can be converted to king bed). Lounge with flat screen TV & Foxtel, fully self contained kitchen, gaming nook, outdoor area with BBQ, double garage and fully equipped laundry. Full refunds (less a $50 booking fee) are possible only with a minimum of one months notice. If less than one months notice is given payment is forfeited unless the property is re-let for the full term of the booking. No refunds of any unused portions of a holiday rental are given. No Schoolies bookings or bookings for groups under 25 years of age will be allowed. Any booking made and paid for online that does not adhere to this condition will be immediately cancelled and refunded less a 20% booking fee. We reserve the right to cancel your accommodation during your stay or upon arrival no refund will be offered in this case. A security deposit (bond) of $1000.00 is required to cover any additional costs incurred as a result of breach of the Holiday Rental Agreement including any breakage damage or excess cleaning requirements which occur due to the guests occupying the premises. The bond is payable a minimum of 7 days prior to arrival. A form will be emailed to you for completion and payment of the bond. A full refund via the same payment method (direct deposit refund) will be actioned after the property has been vacated inspected and deemed to be in the same condition as it was prior to the holiday occupancy. 1).Payment of the holiday rental fee constitutes the guests acceptance of the Holiday Rental Agreement and all Terms and Conditions. 2). Guests are granted a limited permission to occupy the property for holiday purposes only. 3). Failure to comply with the Holiday Rental Agreement and House Rules may result in termination of permission to occupy the property eviction loss of security deposit (bond) and extra charges.